England folded to a humiliating defeat by 10 wickets in Dubai as their woeful batting performance helped Pakistan go 1-0 up in the three-Test series. Trailing by 146 runs, England made a disastrous start as Umar Gul (4-63) removed Andrew Strauss, Alastair Cook and Kevin Pietersen cheaply. 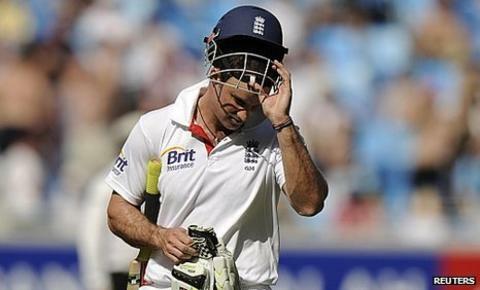 Spinners Saeed Ajmal and Abdur Rehman then claimed three wickets apiece as England were skittled out for 160. Pakistan's openers easily knocked off the required 15 runs to seal victory. Just as it had been in the first innings, England's batting performance made a mockery of their number one Test ranking as their technique and concentration were found wanting. The England batting has been embarrassing at times in this Test. The conditions are different to what they're used to, but they're number one in the world, they've had two three-day games to prepare and they've got all the analysts you could want to tell them about the bowlers they're going to face. But they have just not been able to adapt to the conditions and apply themselves under pressure. Kevin Pietersen and Alastair Cook both fell to poorly executed pull shots, while Ian Bell failed to read Ajmal's doosra for the second time in the match. Only Jonathan Trott showed the necessary application to survive in unfamiliar conditions as he became the fourth-fastest England player to pass 2,000 Test runs, but even the unflappable Warwickshire batsman gave his wicket away on 49 with a loose cut outside off stump. In total, England's top six made only 143 runs between them in the match as Ajmal became the first spinner to claim seven lbw dismissals in a Test. Perhaps the only crumb of comfort for England will be the fact that the early finish gives them two extra days to regroup before the second Test in Abu Dhabi starting next Wednesday. For Pakistan, the next Test cannot start soon enough after the most comprehensive of victories. Gul began the carnage when he had Strauss caught behind down the leg side. The England skipper sent Billy Bowden's decision for review but the verdict was upheld by third umpire Steve Davis, despite HotSpot failing to show any impact with the bat. Cook looked decidedly out of sorts as he scratched his way to five runs off 40 balls. Desperate to find some scoring rhythm, he was tempted into a pull shot by a Gul bouncer, but only managed to feather an edge through to the wicketkeeper. Pietersen at least managed to connect with his attempted pull, but the shot lacked the power to clear the rope and was easily caught by Rehman at deep square leg. And Bell was undone by Ajmal's doosra, the ball striking him on the back pad plumb in front of the stumps. Eoin Morgan again looked relatively comfortable against the spin as he ground out 14 runs before nicking Rehman behind and Matt Prior was pinned back on his stumps by Ajmal. Stuart Broad (17) and Graeme Swann (39) delayed the inevitable with an entertaining 48-run stand before Broad holed out to long-on and Chris Tremlett edged his first ball to slip. Some lusty hitting from James Anderson spared England the ignominy of an innings defeat but Swann's demise to Ajmal ensured Pakistan's target was a mere formality. Earlier, Pakistan's last three wickets had added 50 runs as the hosts took their first innings total to 338. Broad removed Gul in the second over of the day and Swann had Ajmal caught at short leg after another inconclusive review. But Adnan Akmal frustrated England with some improvised shots, cleverly keeping last man Aizaz Cheema away from the strike and reaching 61 - his highest Test score - before he was stumped to give Swann a fourth wicket. At that stage England hopes of a turnaround remained alive, but after Gul's dramatic opening burst, there was only going to be one winner.